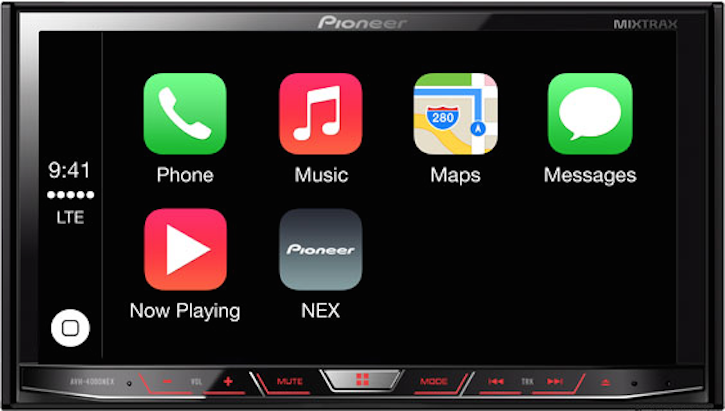 Pioneer announced earlier this week that they will make five of their latest head units CarPlay capable starting early this summer. This is by far the cheapest way to get Apple's latest technology in your car. And the least expensive of all the compatible head units is the AVH-4000NEX. Amazon has the lowest price (see after the break) for the head unit among online retailers (and even big box stores). First, some more details about the AVH-4000NEX. Networked Entertainment eXperience or NEX receivers were announced at CES 2014 this year by Pioneer Electronics. The AVH-4000NEX has the following features. - Apple CarPlay: With a firmware update coming this summer this head unit will become one of the first aftermarket solutions to be capable of Apple CarPlay. With CarPlay, you can make phone calls, listen to your music, navigate, and even have your messages read to you, right from the head unit. - User Interface: Features a responsive, powerful and intuitive touchscreen interface that is highly customizable. - iOS & Android compatible. Note: For CarPlay you will need to use an iPhone 5 or later running iOS 7.1 or later. - Built-in Auto EQ and Time Alignment, and a 13-Band Graphic Equalizer for the perfect sound quality. Other features include MirrorLink connectivity with Android, MIXTRAX, Aha Radio, Bluetooth connectivity, HD Radio, SiriusXM Ready, AppRadio Mode, Pandora, iDatalink Maestro for additional control of your car functions like Aux-In port or USB or steering wheel controls (additional purchase required), USB direct control for iPhone or iPod, Total Traffic Network for real-time traffic data, Dual Zone Entertainment by allowing additional screen attachment, Navigation Ready with the addition of an add-on navigation system. Full details are available from Pioneer. Please note that purchase of cable harnesses and dash kits may be required based on the current entertainment system in your car. Consult your car dealer or car audio professional about installment and requirements.